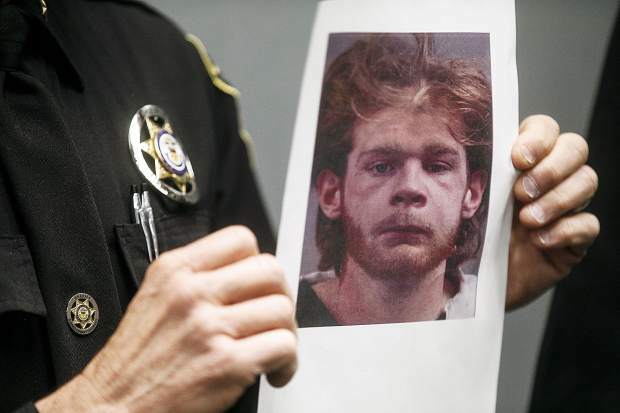 An old mugshot of Tyler Little, who earned his GED while an inmate at the Summit County Jail. A judge allowed him to be released early in light of his achievement. 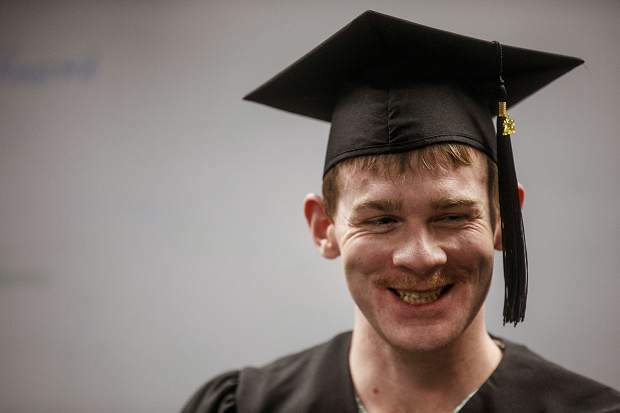 Tyler Little who earned his GED while an inmate at the Summit County Jail. A judge allowed him to be released early in light of his achievement. 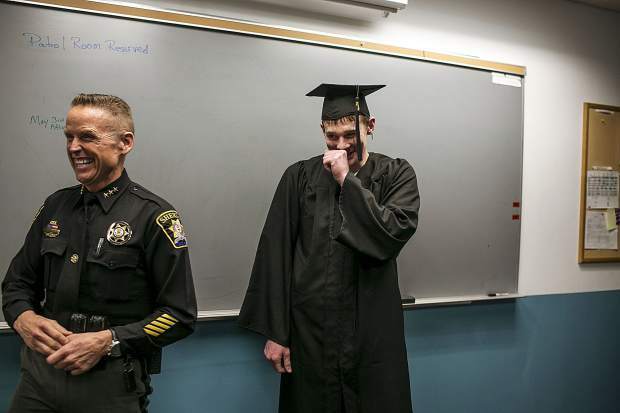 Summit County Sheriff Jaime FitzSimons and Tyler Little share a laugh during a ceremony to honor the inmate for earning his GED. Tyler Little, center, was released early from the Summit County Jail after earning his GED while in cusotdy. 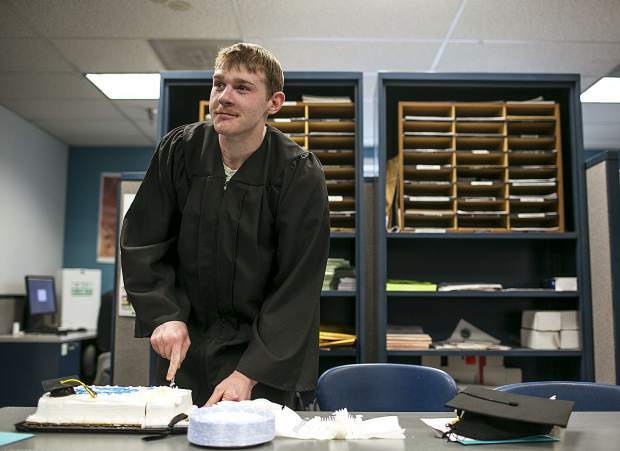 Summit County Jail inmate Tyler Little cuts a celebratory cake after receiving his GED. 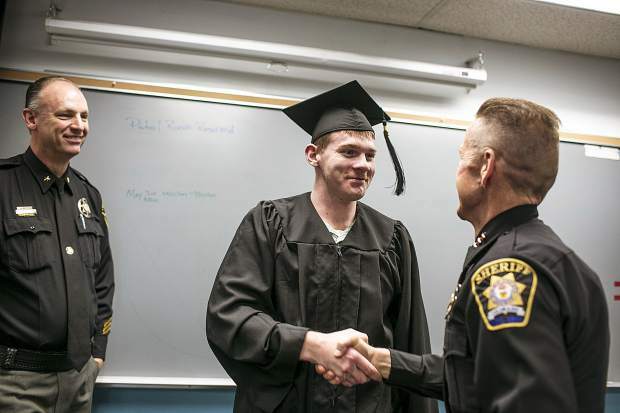 Sheriff Jaime FitzSimons congratulates inmate Tyler Little after he received his GED. A Judge allowed Little to be released several days early in light of his achievement. 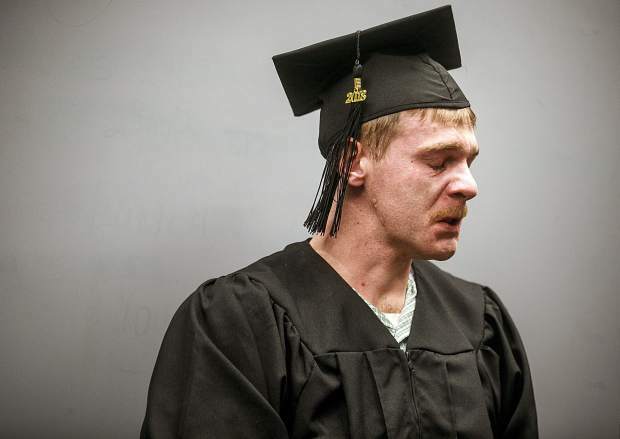 Tyler Little was released several days early from the Summit County Jail after completing his GED while in custody. 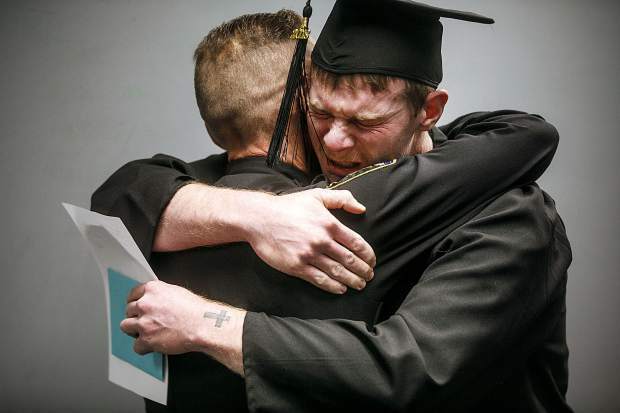 Tyler Little hugs Summit County Sheriff Jaime FitzSimons after learning he was being released from jail early for completing his GED. 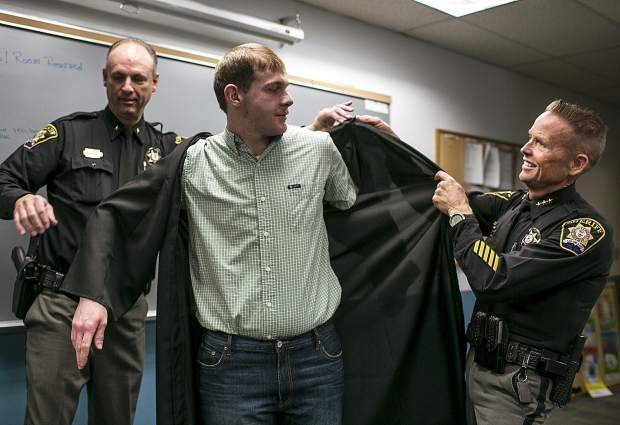 Detentions Commander David Bertling, left, and Sheriff Jaime FitzSimons help inmate Tyler Little into a graduation gown to celebrate the completion of his GED. Meth is a greedy drug. It took his mother from him when he was 15, and it came clawing after him next, offering release from his grief. Along the way, it would try to take everything else he had. His education. His home. His freedom. His self respect. But meth doesn’t always get what it wants. 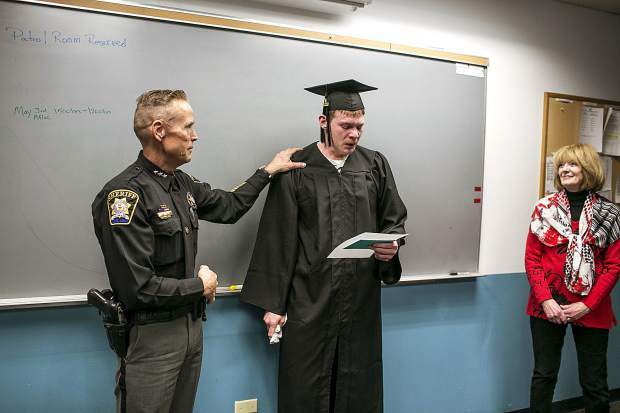 On Thursday afternoon, Tyler Little, still a prisoner at the Summit County Jail, swapped his forest green inmate uniform for a cap and gown, and in the patrol room of the Summit County Sheriff’s Office, he accepted a framed copy of his general education degree. With it, he took back his self-worth, his ambition and the horizons of a future that had been narrowed to a point — the next high or place to crash or brush with the law. “Now I don’t think about what it means if I go back, I think about why I’m not going back,” Little said before a small crowd of sheriffs’ office personnel and members of local churches. Tears welling in his eyes, Little thanked the people who had aided his improbable escape from the swirling drain of America’s criminal justice system, which swallows untold thousands of the mentally ill and addicted. 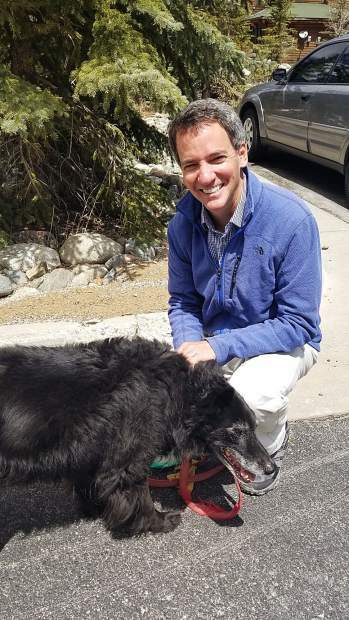 Little has been circling around that drain since his teenage years, long before he came to Summit County. He wasn’t so polite when he first came to the jail. Off his medication and coming down off multiple drugs, Little suffered a perceived slight during meal time and threw a coffee pot through an interior window, shattering it to pieces. 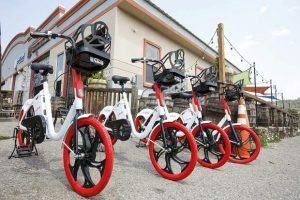 Little has been in and out of the Summit County Jail five times since July, when he was arrested after stealing a bike in Breckenridge. He’s no stranger to handcuffs. Little was diagnosed with bipolar disorder at age 12, just three years before addiction caught up with his mother. He started using the next year. He never knew his father. “That goodness you feel at the first few hits is a lie, because soon it will start taking things from you, and you sacrifice everything in your life to stay high,” Little said. Meth was always Little’s drug of choice, but it made his illness worse. It led to more bad people, more bad decisions and a predictable pattern of petty criminality. A nine-month stint in juvenile corrections for burglary derailed his schooling, and he dropped out in ninth grade. From there, he led a meandering life of drug use, homelessness and odd jobs. Last summer, after a nine-month clean stretch in Conroe, Texas, he decided to move to Alaska, where he would build a house and live off the grid. He needed to get away from the dead-end meth houses. 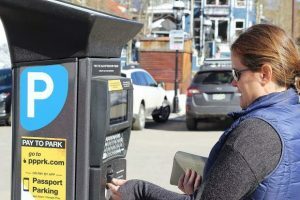 He stopped in Breckenridge, impressed by the mountains. The summer construction season was in full swing, and there was plenty of work to be had. But meth can lurk anywhere. It found him here. During his morning walk through the jail on Christmas Eve, Sheriff Jaime FitzSimons stopped at a familiar sight in Holding 1, a padded cell for crisis inmates. He recognized Little through the window. He had been released just four days earlier. Many American jails function as warehouses for the mentally ill and addicted, whose ailments snare them in a cycle of low-level offenses. Little’s latest arrest was for being drunk, a probation violation. FitzSimons was tired of seeing Little locked up. They had a heart-to-heart through the glass window of the holding cell door. Little started taking GED classes and asked his instructor if it would be possible to earn his degree while incarcerated. “She said, ‘It is possible. It will take a lot of work, but it is possible,’” Little recalled. His posture straightened as he explained the structure of his studies. Four sections: language arts, social studies, math and science, his favorite. He completed at least one lesson per day on weekdays, sometimes two. 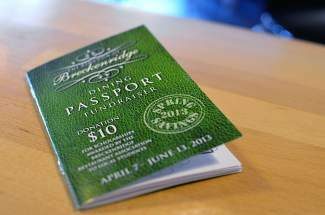 On weekends, he read for pleasure — Christopher Paolini’s Inheritance Cycle series or anything by Stephen King. In the meantime, Little took addiction courses offered by Pastor Rick Backlund of the Agape Outpost. He also got some help from Father Dyer United Methodist Church in Breckenridge, which agreed to cover the $150 fee for his GED test. On April 14, he passed. It was his first academic achievement in nearly a decade. Time closes in on people addicted to meth. Amidst the drug-induced reverie, the future is a narrow tunnel leading only to more highs. Not anymore. Now, Little has his GED. He has plans, pride and hope. “At this point in my life I’m focusing on repairing and planning for the future, which is something I didn’t do before,” he said. He decided to move into Agape’s sober living house, which has also lined up a job for him, after his scheduled release on Saturday. After saving enough money, he plans to go back to Arkansas, buy some land and build a house. He wants to help out his sister-in-law there, who has been raising seven kids on her own since Little’s older brother went to prison. 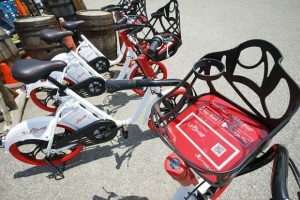 “I want to build something for them that I can share with them and leave behind for them,” he said. On Thursday, he got a small head start on those plans. After the ceremony, FitzSimons had a final surprise for Little: an order from Judge Ed Casias. Little was overcome. In his cap and gown, he gave the sheriff a bear hug. His former guards joined in the clapping. “It was tough pulling your leg all morning,” one quipped. Then it was time for cake. Little served his guests.